Houdini accepted many challenges throughout his life. In truth, he set up many of those very challenges. 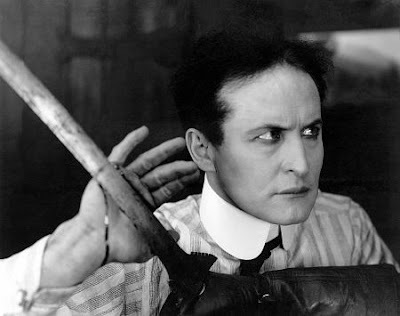 But in October of 1921 Houdini was hit with the most darling challenge of his life! I found this little story in the Oct 2, 1921 edition of the Saginaw News Courier. The headline of the article reads "HOUDINE Stopped, Wife is Reason He Can't Go Through". Yes, they spelled his name wrong in the headline. Apparently, Houdini received a letter from a young lady in Auckland, New Zealand. In the letter she said she was 18 and alone and had an annuity of 2500 pounds per year and she was 'willing to accept a proposal of marriage from Houdini'. The letter went on to say "she knew by his motion pictures that he was an honorable man and therefore had implicit confidence in him. She suggests that if he will cable her she will come by the first convenient boat to become "personally acquainted" with him." She goes on to say "They can keep company for three months and if after that time they find they are not mutually fit she can return home. She adds, she is not stage struck, but simply thinks that fate will be kind." Actually I got ONE! LOL. But it turned out to be a friend of mine. Still it made me laugh.